Meet Greene County’s Cutest Pets! Anna Bolton | Greene County News Duncan, 13, poses with his human, Ann O’Donnell, outside the Gazette office April 11. Greene County voters selected Duncan to be honored as Greene County’s Cutest Pet. Amora, 1, takes up post at her normal spot outside Snap Fitness alongside her human, Corey Jackowski. Amora, too, was named Greene County’s Cutest Pet after official final results were counted. 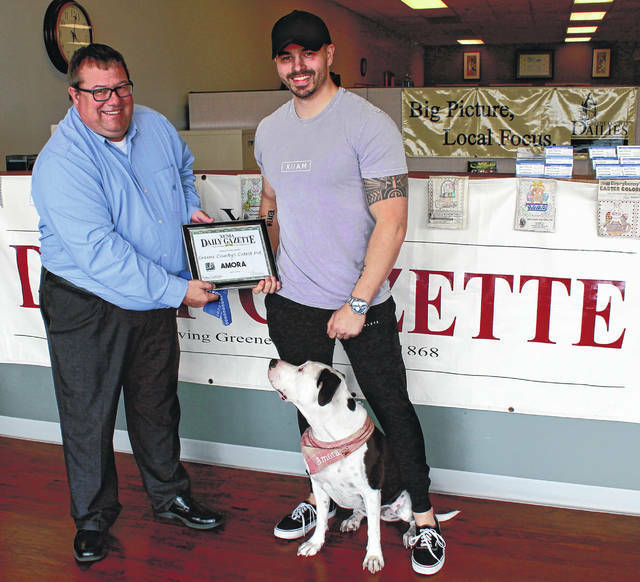 Xenia Daily Gazette Managing Editor Darrell Wacker presents the Cutest Pet award to Amora and Corey Jackowski. Ann O’Donnell and Duncan accept the Cutest Pet award from Xenia Daily Gazette Managing Editor Darrell Wacker. XENIA — Two local dogs — one big and spotted, one small and fluffy — proudly wear the title of Greene County’s Cutest Pet today. 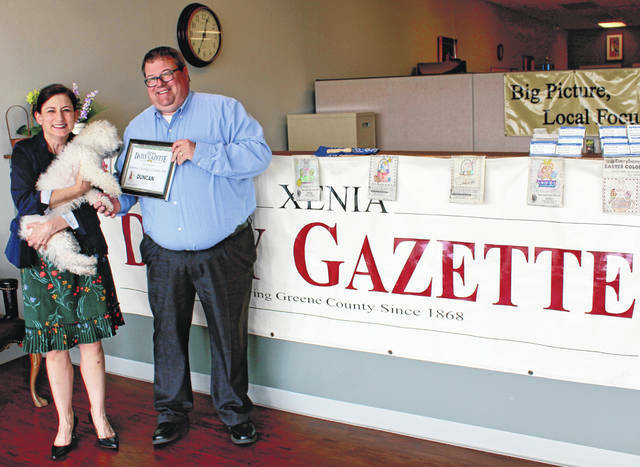 Xenia Daily Gazette Managing Editor Darrell Wacker presented Duncan, of Yellow Springs, and Amora, of Xenia, with their first place prizes April 11. Their humans were there too. The winners each received a $25 gift certificate to City Barbeque, a bandana and a bone. Duncan, a nearly-14-year-old bichon, recently lost his eye due to glaucoma and sports a pirate eye patch some days. Duncan, who was inseparable from his buddy Winston for 13 years, loves toys, snow, belly rubs, and his mom Ann O’Donnell. Duncan led the contest in the votes-by-mail category. Amora, a 1-year- and 7-month-old pit bull, spends her days next door at Snap Fitness with her dad Corey Jackowski. Known to gym-goers and business neighbors as a very good girl, she’s accustomed to getting petted all day long. Amora loves her pink monogrammed bandana, chewing on toys and patrolling the parking lot from her bed. Amora received the highest number of votes on Facebook. The contest included 17 candidates of all shapes and sizes — including a turtle, a hedgehog, and a bearded dragon — from all around Greene County. Voting began March 20 and closed April 5. The winners each received close to 200 votes. The Gazette sat down with the winners after they received their awards. Gazette: Amora, how does it feel to be one of the winning dogs? Gazette: Were you expecting to receive that many votes given that you don’t get around town that much? Amora: *raises her paw for a shake* Woof! Gazette: Duncan, you made a late charge at the end to force a tie. What were your thoughts as it unfolded? Gazette: You got a chance to meet Amora at the presentation. How did that go? https://www.fairborndailyherald.com/wp-content/uploads/sites/50/2019/04/web1_DuncanBest.jpgAnna Bolton | Greene County News Duncan, 13, poses with his human, Ann O’Donnell, outside the Gazette office April 11. Greene County voters selected Duncan to be honored as Greene County’s Cutest Pet. https://www.fairborndailyherald.com/wp-content/uploads/sites/50/2019/04/web1_AmoraBest.jpgAmora, 1, takes up post at her normal spot outside Snap Fitness alongside her human, Corey Jackowski. Amora, too, was named Greene County’s Cutest Pet after official final results were counted. 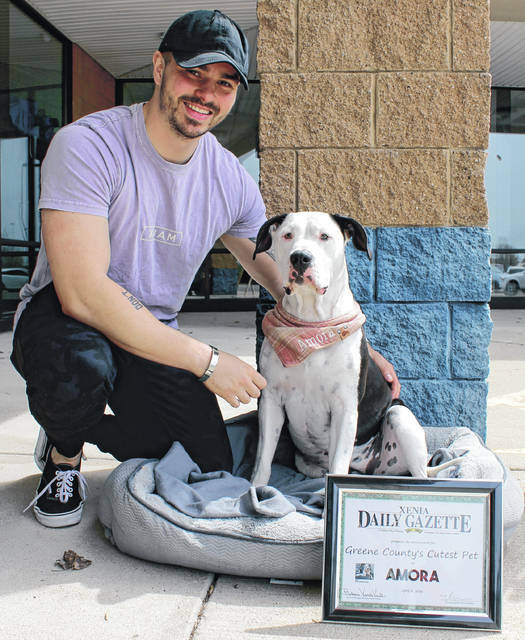 https://www.fairborndailyherald.com/wp-content/uploads/sites/50/2019/04/web1_AmoraAward.jpgXenia Daily Gazette Managing Editor Darrell Wacker presents the Cutest Pet award to Amora and Corey Jackowski. 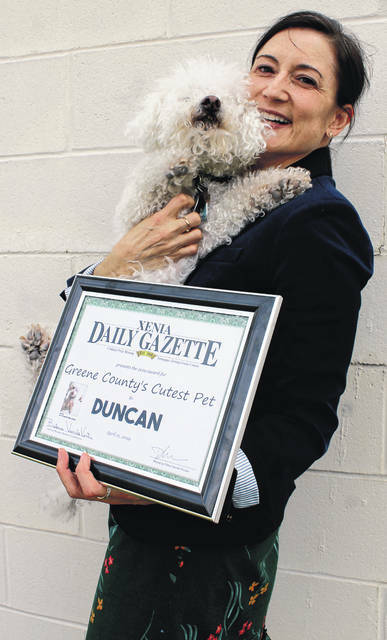 https://www.fairborndailyherald.com/wp-content/uploads/sites/50/2019/04/web1_DuncanAward.jpgAnn O’Donnell and Duncan accept the Cutest Pet award from Xenia Daily Gazette Managing Editor Darrell Wacker.